Truth or Consequences Hot Springs - Amazing Mineral Water! Since before recorded history, the therapeutic benefits of the hot springs in this area have drawn people here. The hot thermal water flows out of a rift along the Rio Grande that appeared more than 50 million years ago. The rift uplifted Truth or Consequences’ landmark hill, and faults along the rift allow deep groundwater to flow freely to the surface without losing heat or minerals—producing pristine waters with temperatures ranging from 98 to 115 degrees, with trace elements of 38 different minerals. The pH of the water is 7, or neutral. — The water has no unpleasant odor. — The single largest ingredient in the water is chloride, a naturally occurring germ killer that sterilizes the skin and ensures the purity of the water. Some were prescribed the “21 day soak” regimen, said to cure “anything that ails you.” In a nutshell, the regimen is – soak in our hot springs once daily for 21 days, at around the same time each day, and spend as much time resting & recovering immediately afterward as you taking the waters. Today, the charmingly restored hotels, motels, RV parks, and spas reflect this history and offer travelers a wide range of accommodations that retain the flavor of this bygone era, along with healing treatments including massage, reflexology, mud wraps, reiki, and more. Visitors seeking private baths in their hotels rooms have several options. See our list of hotels with hot springs for more info. Most of the baths are open to walk-ins who can pay to soak by the half hour or hour. Open to walk-ins from 9am-9pm Mon-Thurs and 9am-10pm Fri-Sat-Sun. Call ahead, book online, or stop in with cash or a credit card to soak in any of the 6 private baths. Rooms on the main property have in-room baths (and one mineral water shower) for unlimited soaking. 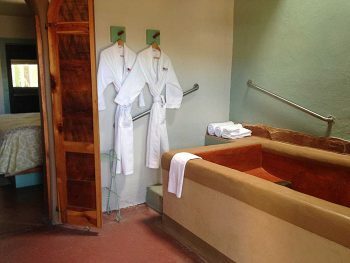 Lodgers and non-lodgers can book an indoor bath in either of the two ceramic tile baths (the “historics”), which are perfect for 1 person, or the Wet Room—a hot spring pool plus geothermal steam room that features a neck massaging waterfall. Three roomy outdoor baths are available as well. The “historics” cost $5 per ½ hour per person. 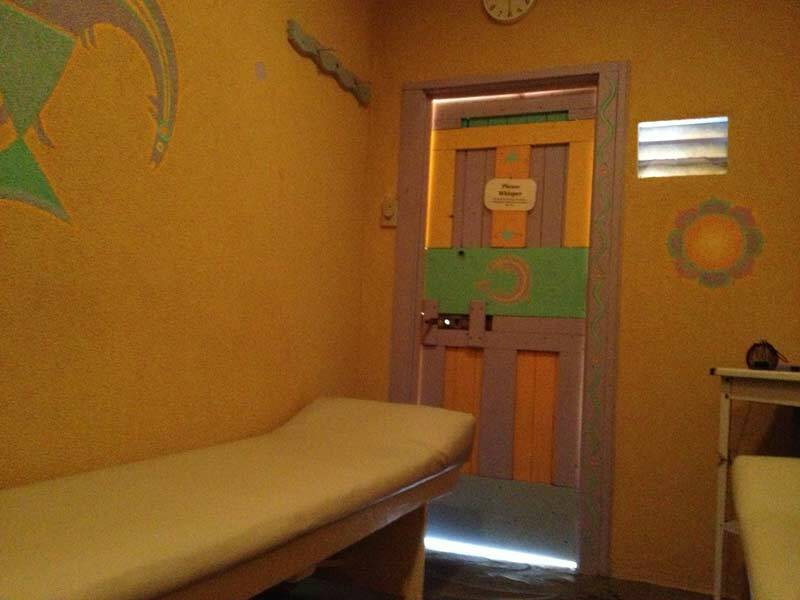 The Wet Room and the three outdoor baths are $35 per 50 minutes, 1-2 people, and $10 per each additional person. Reservations are recommended. 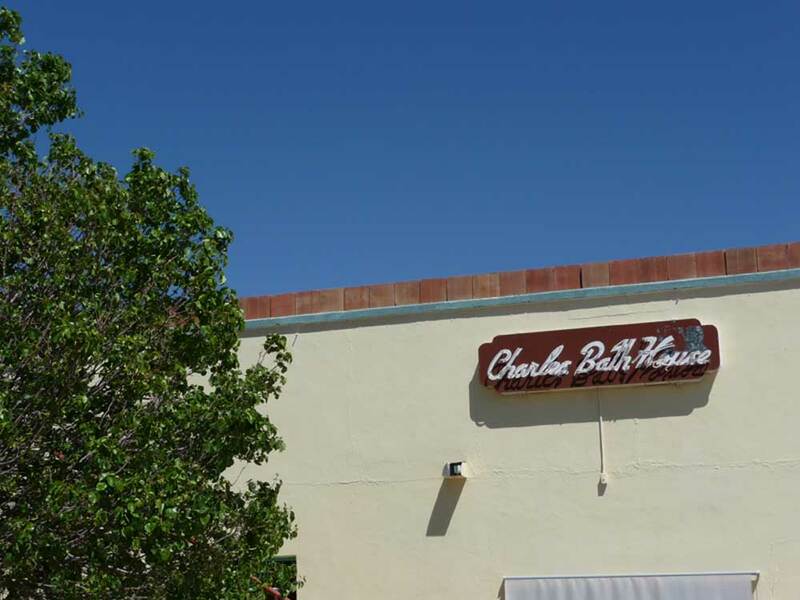 Baths at The Charles are open to walk-ins from 8am-10pm. Punch cards are available; buy in bulk and save $1 per soak. Soaks are $6 per person for single indoor soaks; $10 per person / per hour for outdoor rooftop soaks, maximum 8 people. (Guests of the motel pay $8 per person.) Indoor baths are private bathing stalls with tiled tubs. Two private jetted whirlpool tubs are available on the rooftop. 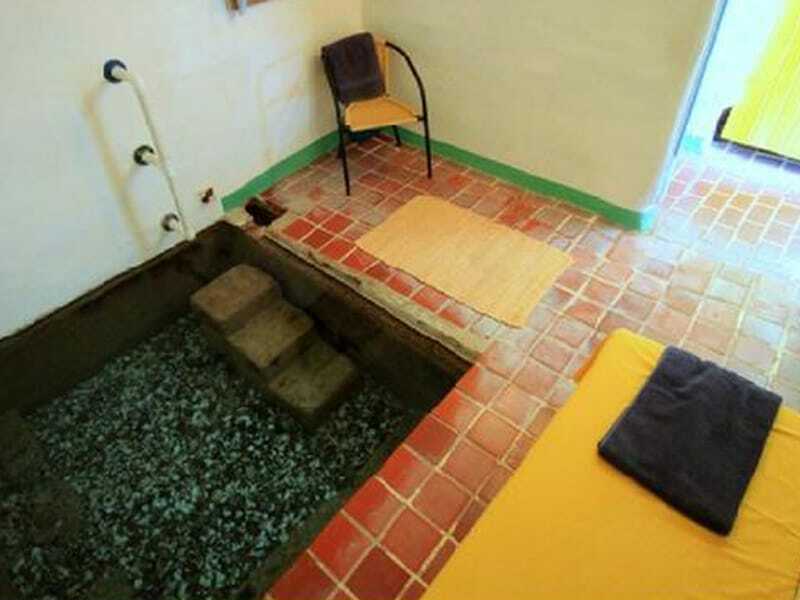 No walk-in soaks are offered at Fire Water; baths are on site for lodgers and their guests. 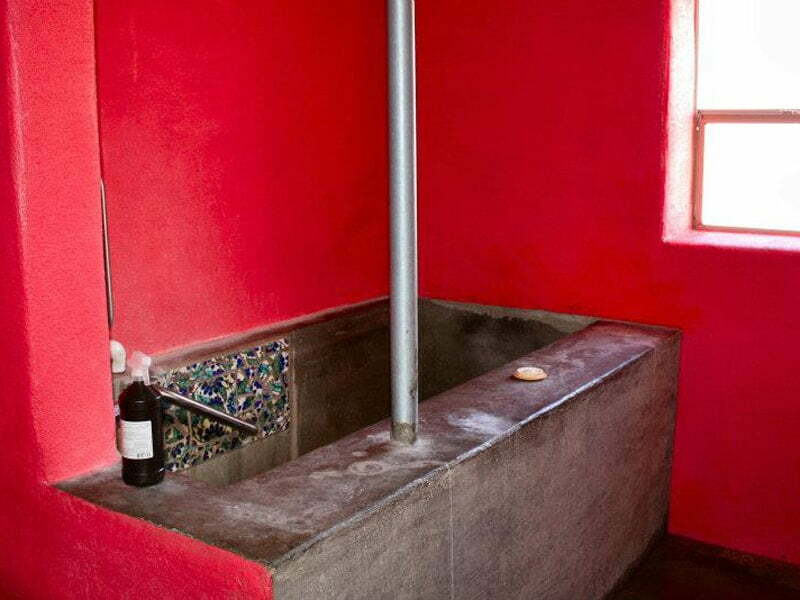 Six rooms at Fire Water have indoor baths; some are concrete, others are ceramic tile, one is stone & ceramic, one is metal. Each bath is in a private enclosed area. 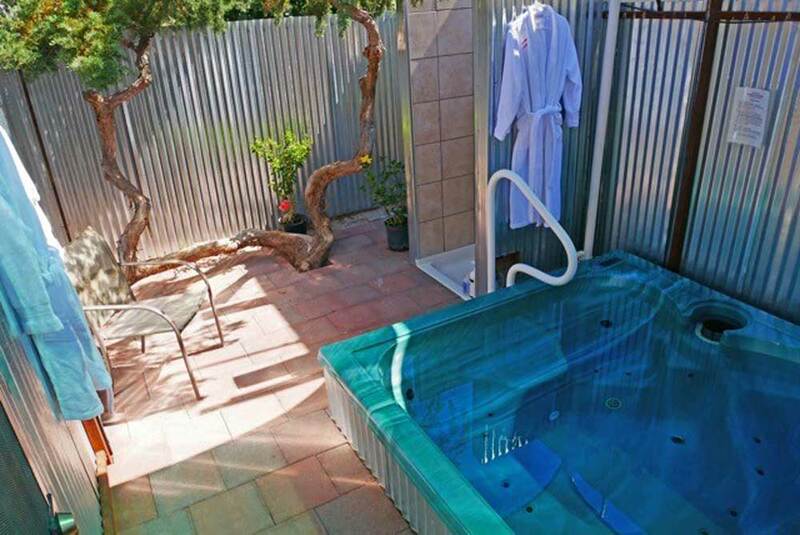 One outdoor bath, a jetted whirlpool in a private fenced-in area, is available for use by all lodgers on a first come / first served basis. Walk-ins are welcome during business hours, between 1 and 8:30pm. The Hoosier opened its baths to walk-ins in 2017. Guests can soak by the half hour or hour during open hours. Appointments outside of normal walk-in hours can also be scheduled. Rates are per couple: $10 per hour, $5 per half hour. 3 outdoor baths and one large indoor bath are available. The indoor bath includes a separate bathroom with a shower. Walk-ins are welcome at Indian Springs on a first-come/first-served basis. Stop by between 8am and 9pm daily! 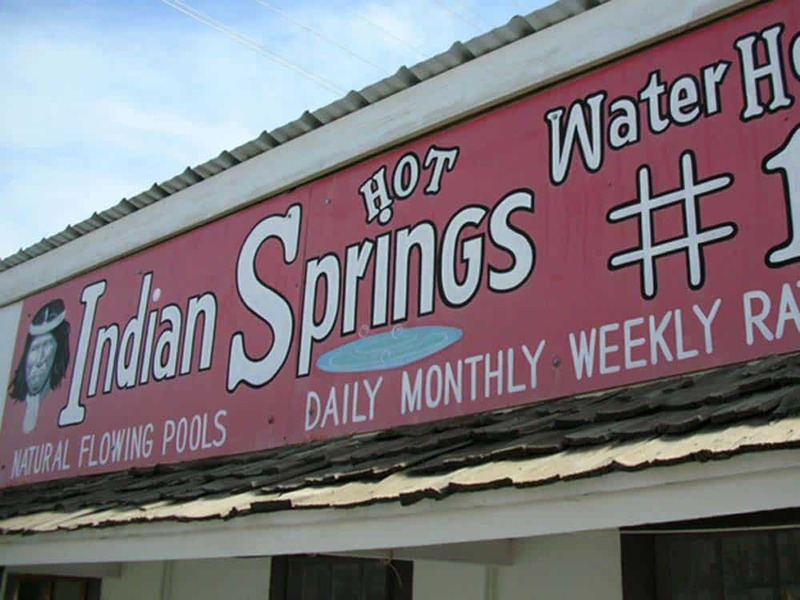 Indian Springs has a 6×8′ bath that can accommodate up to 6 people and a 4×4′ bath that can accommodate 1-2 people. Lodgers get two free half-hour baths per day. Rates are $4 per person for a half hour bath. Pools are gravel-bottom, mostly natural flow, but a pump in the small bath maintains constant flow. 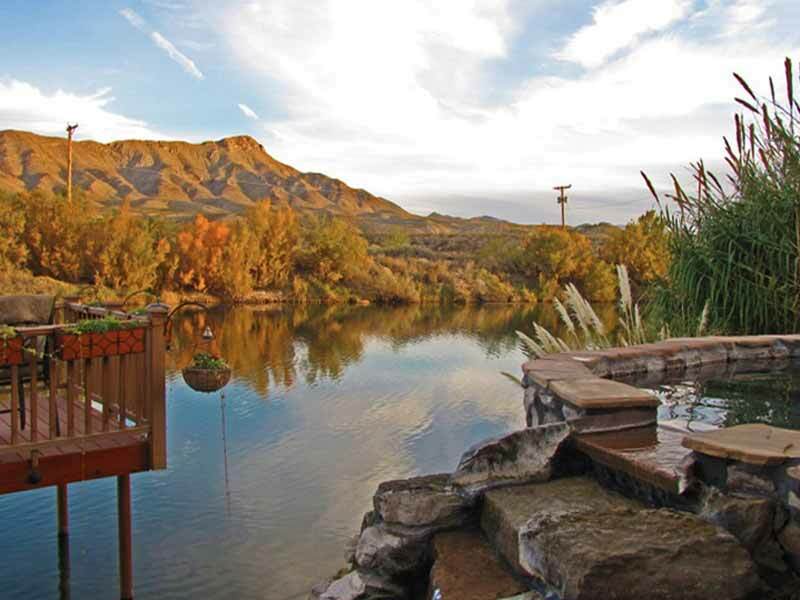 Walk-ins are welcome at La Paloma Hot Springs & Spa from 10am-10pm daily. Natural flowing hot mineral baths with temperatures from 98-115 degrees are available to lodgers 24/7 and non-lodgers during walk-in ours. Benches are situated next to the private pebble-bottomed baths for cooling off or just resting. The bath house is whisper quiet. Show your ID to get a free soak on your birthday. La Paloma Too (formerly Hay-Yo-Kay) is open to walk-ins Sunday through Thursday from 2-8pm and Friday & Saturday from 2-10pm. La Paloma Too has the oldest baths in town; several gravel-bottom natural flow pools are available by the half hour ($6) or hour ($10). Bottled water is available to buy; rent a towel for $1. 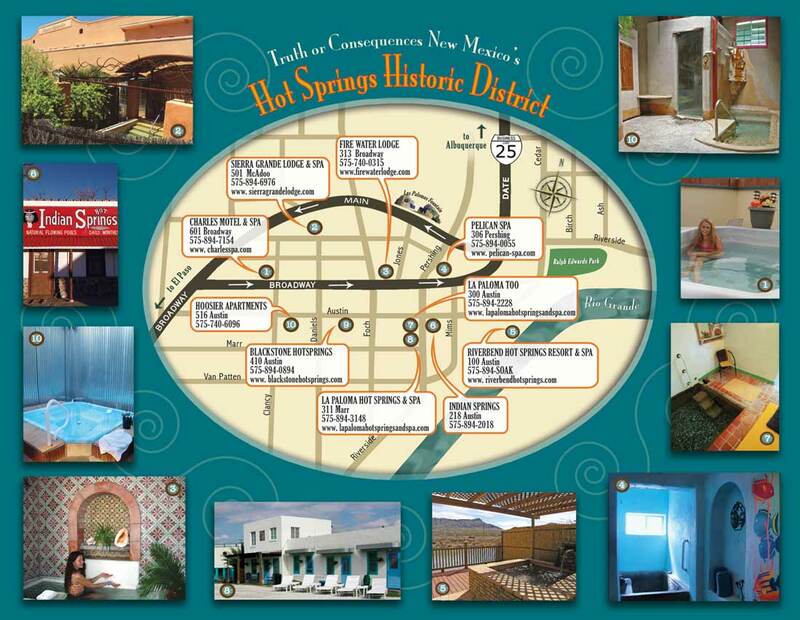 Lodging is available next door at La Paloma Hot Springs & Spa. Open to walk-ins Sunday through Thursday from 9am-9pm daily. Guests have unlimited access to five concrete tubs, all indoors. Four of these baths can accommodate a couple, and one bath can accommodate up to 6 people. Cost to soak is $6 for 45 minutes. Walk-ins are welcome during business hours, 8am-10pm, with the last soak at 9pm. Choose from seven private baths: Apache, Cielo, Navajo, Rio, Tewa, Tierra, Zuni. Sessions are 50 minutes, $15 per person per session; $10 per person per session for lodging guests. Public baths include a concrete and stone bath divided into three sections, each a different temperature; two separate stone pools of varying temperatures are nearer to the river. Walk-ins paying $12 per hour have access to the public pool area, deck, patio, and sauna, areas normally reserved for lodgers only. Walk-ins are welcome, but it’s suggested that you call ahead to book a spa treatment or hot mineral bath. Indoor soaking options at Sierra Grande include 2 stamped concrete baths, each accommodating 1-2 people, and a large ceramic tile bath that can accommodate up to 8 people. Outdoors, a large stucco & tile bath under a pergola accommodates up to 4 people. 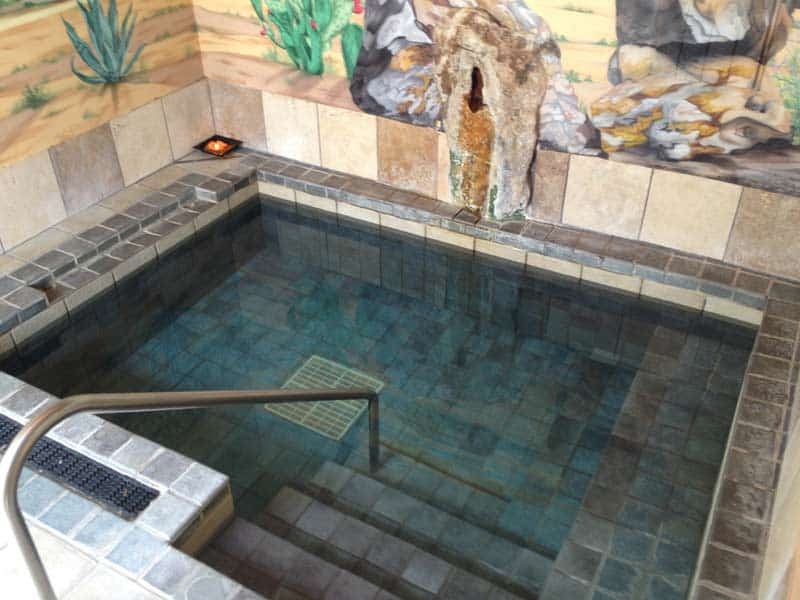 If you're looking for an opportunity to be pampered to the nines, there are two full-service spas in Truth or Consequences/Elephant Butte, and massage and other treatments can be arranged on-site at several hotels in the county. Please see our Massage & Body Work page for more information. Downtown Truth or Consequences sits atop a large natural aquifer that produces somewhat salty, odorless water ranging in temperature from 100-115 degrees Fahrenheit. Were the city (and nearby Elephant Butte Dam) not here, the downtown area would be a swampy basin of warm mud, subject to seasonal flooding from the Rio Grande. During the late 1800s, while neighboring areas like Kingston and Chloride were experiencing the Gold and Silver Rush, the hot springs were visited by more and more people and the area became known as "Palomas Hot Springs." The first generation of bath houses were actually tents, and a soak entailed laying in the hot mud and slathering it all over oneself; doing so was thought to cure rheumatism. The event that changed the area forever was the construction of Elephant Butte Dam between 1911 and 1916. 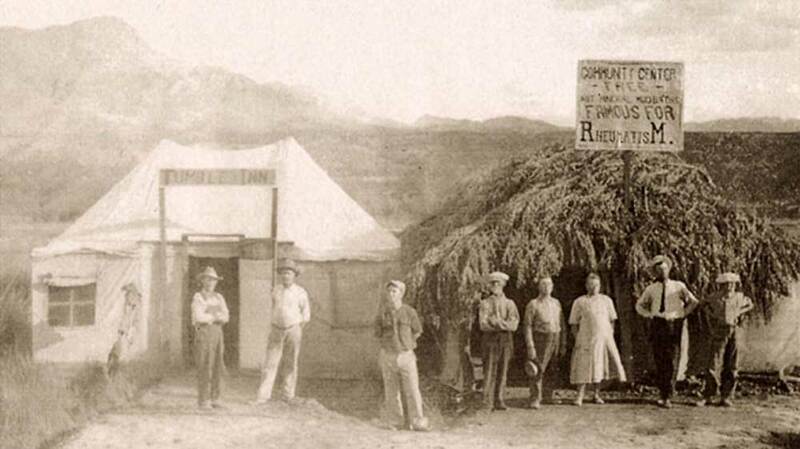 Liquor and gambling were outlawed at the construction site, but establishments in the hot springs settlement five miles away offered both - and in abundance. The population grew rapidly and the town was incorporated in 1916. Once the dam was completed, the flow of the river was altered such that more land could be claimed from the flood plain, allowing for stick frame bathhouses to be built in what had been swamp. Wells were sunk into the aquifer, allowing clear spring water to flow. The town developed as a health resort; hot mineral water was an accepted medical treatment, and slogans like "City of Health" and "Health Capital of the Southwest" drew visitors and healers alike. Over the course of the 20th century, the town’s name was changed first to Hot Springs, then famously to Truth or Consequences. Some say that last change caused the mineral baths to be forgotten, but today the hot springs seem to be experiencing a resurgence in popularity.